On September 28th, we’ll be attending the 36th Annual News and Documentary Emmy Awards in honor of two films that we supported from their inception, “Bully” and “Private Violence”. “Bully” received 2 nominations, one for “Best Documentary” and the other for “Outstanding Informational Programming-Long Form”. “Private Violence” was also nominated in the “Outstanding Informational Programming-Long Form” category. Last year these two films that are near and dear to our hearts premiered on national television screens, one week apart. As it is was not only “Domestic Violence Awareness Month” and “National Bullying Prevention Month”, there was some symmetry to that. “Bully” opened the PBS Independent Lens season on October 13th, 2014. “Private Violence’ premiered on HBO on October 20th, 2014 As early supporters of both projects, we at Waitt Institute for Violence Prevention couldn’t have been happier about that. But their road to the finish line couldn’t have been be more different. 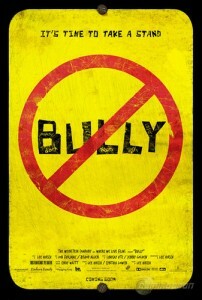 A national phenomenon, when released in March, 2012, “Bully” had the “buzz’ from the start. It struck a powerful chord, in its riveting and authentic footage of children and families devastated by bullying. Kids tormenting kids hits us at a basic level, and it’s a powerful punch. “Bully’s” path to completion was relatively swift, as enthusiastic funders signed on beginning in late 2009. When it premiered at the Tribeca Film Festival in 2011 to audience and critical praise, ”Bully” was quickly bought by the Weinstein Company, ensuring its theatrical release, and thrusting it into the national consciousness. Lee Hirsch and Cynthia Lowen’s story, that was in its first stages when they found us in 2009, was and is a perfect meshing of the right time, right place, and right issue. The skill and passion of the filmmakers has helped spark a movement no one could have predicted, which is more than a good thing, it’s a great thing. “Private Violence”, a film we came on board with in 2006, is a very different story. Cynthia Hill’s direction, Kit Gruelle’s voice and vision throughout, and Deanna Walters frightening and extraordinary journey weaves the experiences of domestic abuse survivors and advocates, as it challenges, and consequently explodes the myths behind domestic violence. It finally answers the age old question, “Why doesn’t she just leave’? While this documentary was driven by the same hopes, concerns, and passions as “Bully”, the supporters and crew of “Private Violence” faced a tougher path to completion. Production and post production of “Bully” took about two years to fund. “Private Violence”, premiering on HBO October 20th, was started over 8 years ago. For all of us at both the Waitt Institute and the Kind World Foundation who backed the film and for all the others who worked to see that film completed, it was a long road. It happened faster for “Bully” and that didn’t completely surprise me. In my 23 years of philanthropy, I’ve seen children’s issues get funded first. They are the future, and we have to work with them now. It also had never been done. It was desperately needed and it was time. But we have to see that the first time some children see or witness violence isn’t the school yard. It’s where they live. Approximately 8.2 million children were exposed to family violence in the last year alone. Though we have stalwart advocates on both sides of the political aisle in both movements, we need to move past the national disconnect that still happens with some policy leaders and the general public, who don’t see how intertwined these two issues are. As we advocate that prevention should start with kids, let’s not forget that bullying prevention education can be paired with the critical piece of age appropriate relationship violence awareness programs that can help change the attitudes and behavior of young people as they begin to enter adulthood. Dickens’ famous quote “it was the best of times, it was the worst of times” could describe what we, in the violence prevention movement, feel today. As many strides as we’ve made, we still have a long way to go. Linking violence in its many forms and helping kids, educators, and families connect those dots is vital. As a Futures Without Violence ad campaign suggested, “Teach them early, teach them often.” With dating violence and bullying prevention, teach them together. Brilliant post, Cindy. I’m adding a link to your post on my blog. It seems that every time someone tries to break down the walls of silence on domestic violence, the status quo jumps in to shut us up. I think perhaps the support of the uber-politically active LGBT community was essential to BULLY’s success. Thanks, Caroline. It is so important to keep the conversation going about all forms of violence, but I wanted to make a special point about violence in the home. And, yes, we’ve received so much support for “Bully” through many groups…just hope we can raise that level of awareness about relationship violence. Thanks, as always, for coming to the site and for all you do! Great point! We are quick to step up when it comes to prevent bullying but we often forget that the “Bully” is modeling behavior they likely learned at home or has become desensitized to violence because it is a part of their daily life. If we can prevent or reduce children’s exposure to domestic violence, we will take a major step in preventing bullies. Thank you for connecting the dots for us all to see. How true it is….all of it connected! Great article, Cindy! True prevention always involves changing the beginning. Although I knew it to be true, I’d never heard the quote before: “If you have violence in the home then it normalizes it everywhere else.” But it’s so very true! Whatever your role was in your family, the tendency is to perpetuate the same role, to at least some degree, throughout life. If you survived by attempting to ignore what violence you witnessed and pretended it didn’t happen, as an adult, when confronted with a similar situation you may be more comfortable looking the other way instead of intervening. Keep showing those connections, Cindy! There is much for all of us to learn. You are right about family roles, Alma. Those early experiences do shape us. Too many children witness violence and poor role modeling in how to treat others with respect and dignity. Nice to hear from you. It’s so important that we don’t forget gender violence, all of it is linked. Thanks for all you do and keep being such an inspiration for young men! !